Oh dear, it’s Dysart again! This is the setter who caused me so much wailing and gnashing of teeth last July when his Father Brown puzzle brought my run of 120+ correct Listeners to a screeching halt. Since then, I have had a handful of other failures or silly mistakes, including the unforgivable omission of the highlighting of some stupid carrots! Anyway, to the task in hand … to somehow beat Dysart this week. For the first time in what seems an age, the clues were all normal, all entries were to be entered without adulteration, and there were no clashes. 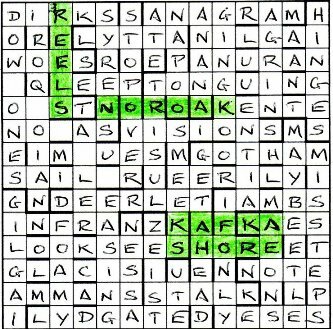 In the finished grid, an author and his place of birth would be obvious, together with four of his works. An easy week lay ahead! I won’t do my usual trick of giving the first clues I solved followed by a statement to the effect that “everything was pretty straightforward after that”. This is mainly because most of the clues were tricky and some held me up for quite a long while. Instead I’ll just mention the last few clues I got — ones that gave obvious answers, but where the wordplay eluded me for quite a while. 34ac held be up for some time early on because I stupidly just put in IAMBI instead of IAMBS! This made 28dn M-I-S-E-S totally impossible! 15ac Amphibian, name unknown, caught by a thrust was ANURAN … NU (name unknown) in A + RAN (where ‘thrust’ is to be read not as a noun or even the present tense, but the past tense). 45ac Memo: “A person with no regular income is out of the question!” gave NOTE (NOT E); this clue introduced me to E meaning a person with no regular income which I’d not encountered before. And then there were two clues which completely stumped me: 5dn and 8dn. 5dn was “Traveller’s Rest” perhaps seen to supply cups which was STOPOVER, and 8dn The star entertainer in the line-up could tell you how to get this fruit for ANANA. Help needed on those please. Finally the end game, and we had to find the author, FRANZ KAFKA and his place of birth, PRAGUE. Of course, we were supposed to think “No Prague, but I know that in the Czech Republic it’s PRAHA”! The trouble is that that wasn’t in the grid either. I spotted JUMBO in a diagonal, but that didn’t help, although I slotted it away for almost certain use at some point. For me, it was about 30 minutes of floundering before I wondered if Dysart was playing a delicious trick, and I eventually found the Japanese author HARUKI MURAKAMI in the main NE-SW diagonal and near the top of the grid was his birthplace KYOTO. Bingo! And now to find his cryptically represented novels. Dance, Dance, Dance was there as 3 REELS, the 3 being the only number to be entered in the grid; KAFKA ON THE SHORE was there in rows 10 and 11. The third novel to be highlighted took me forever to find. Was it Norwegian Wood or Sputnik Sweetheart or After Dark, all of which gave ample opportunity for cryptic representation? Eventually I spotted NOR OAK in row 5 and breathed a sigh of relief. Finally, as suspected, The Elephant Vanishes required JUMBO to be erased. So, this week, I got the better of Dysart, but he certainly tried hard. A really enjoyable and entertaining puzzle, so many thanks to him for that. This entry was posted on 18 May 2012 at 5:00 pm	and is filed under Solving Blogs. You can follow any responses to this entry through the RSS 2.0 feed. You can leave a response, or trackback from your own site.